Through the years, the Fund has been able to offer many people a chance to volunteer in Santa María. It has become a destination of choice for many language undergraduates wishing to spend a few months or even a year working in Paraguay. The main task is the teaching of English at many levels from beginners and children up to Cambridge examination standards. However, many of our volunteers have also had other talents, and they have helped with classes in singing, violin, recorder, piano, and most of all, music theory, as well as quite a lot of football and of course computer studies. Not all our volunteers have been undergraduates – we have benefited from the experience and special skills of some older people as well. 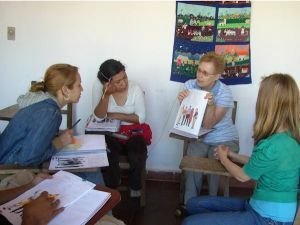 And not all our volunteers have been exclusively in Paraguay – we have many supporters here in the UK who have helped with fund-raising by running marathons and other splendid efforts. You can see who is currently volunteering here, and a list of all our former volunteers through the years can be found here.